I received a letter from a follower who is writing a book on her father’s life. She is using letters home which her father wrote and had a gap on how he got from New York to Fort Benning, Georgia. Questions like what did he wear, where did he eat, where did he sleep. Told her I would write a fictional story based on what facts I knew. Dad’s orders wanted him to appear at 07:30 hours in the morning. When he got off the Central Avenue bus he recognized several others waiting in the crowd. A sergeant who looked like a veteran of the Great War was handing out papers to be completed. In the meantime a train had left Utica with four passenger cars. One of them was a Lackawanna car just off their Utica branch. The other three were New York Central cars off of the Adirondack Division. Dad and the other recruits were “formed up” into a marching group, administered an “oath of office” and walked past the Capitol building to Albany’s Union Station. There was no band playing, but they were cheered on by citizens on the street. At the Albany Station, the train from Utica had arrived and a switcher had brought three more cars and what would serve as a diner over from the West Albany Car Shop. The “diner” was loaded with box meals from the New York Central contractor, a Madison Avenue bakery. Once the train was through New York City, the rest of the trip would be on “foreign”railroads. New York Central put good power on the train: a “Mohawk” (called a “Mountain” on other railroads……but not on the Water Level Route). The train leaves before 11am and makes stops at Castleton, Hudson and Rhinebeck. Now the train is filled. Next stop is Harmon to change engines to an electric one. Now the train runs to Mott Haven then switches to a New Haven electric motor for a trip across the Hell Gate Bridge. Now they hook up a Pennsylvania Railroad GG1 locomotive headed for Washington. In Washington DC, the Pennsyania Railroad bypassed Union Station and went directly to the huge Potomac Yard across the river. The GG1 was replaced by a modern steam engine belonging the Southern Railway (a founder of the current huge Norfolk Southern System). Reaching Georgia, the train changed over to the Central Of Georgia Railway for it’s trip to Columbus, Georgia and Fort Benning. Fort Benning at that time was relatively new. It had been created in World War I. So basic training housing was walking distance to the train. There was once a two-foot railroad around Fort Benning…..but the walk was easier. Guarding New York Harbor, Governors Island has always been some kind of a military installation; now just an administrative place. It was reached by a ferry that left from the slip next to the Staten Island Ferry. Surprisingly, at one time, Governors Island had its very own railroad. The G.I.R.R. was only 1-3/4 miles long, but it was completely equipped with 3 cars and an engine. It was one of the smallest railroads in the world. There are no traces of the railroad on the Island today. Even the Coast Guard uses Railroads! Like troop trains, camp trains were extra movements too. I’ve seen a picture of a string of Pullmans stored at Cedar Hill. The caption says that the cars were pulled from storage in numerous locations. But looking from right to left in the picture there are a few cars that are out of place. The Pullman green car reads Northern Pacific above the windows, the next car looks like it is Union Pacific, and two cars to the right the paint scheme looks like Illinois Central. So what are these cars doing in Cedar Hill? Kind of strange to use Pullmans from the west just to hall kids home from camp. These cars were all under lease to Pullman no matter what RR owned them and Pullman could use them in differing areas when they saw traffic such as the camp moves. Too many people think of passenger trains in a parochial was as all being matched and that was not the case in 90% of the trains. It was about available cars and space configuration. The main Pullman facility at Sunnyside was a riot of colors and road names due to interlining of space to NY station. In addition to the summer camp trains for the kiddies, there were also summer camp trains for the grown-ups – National Guard soldiers going to the Cape, Fort Devens, and other training areas. The early 1960’s were the last years for many of these veterans as day one of Penn Central they made it known that they would not handle any more camp specials over any part of the former NHRR. By this time were no heavyweight Pullmans in regular use and Amtrak was only three years into the future. Anyone getting any ideas about enlisting in the US Army reserve (yes, they have railway units) should realize ahead of time that, in the future, USAR intends to recruit its personnel from industries with the skills it seeks so it can focus on combat training during drill weekends and annual training. That means they’re looking for people who are already railroaders who can bring their skills to the unit, where they will spend their limited training time preparing for combat. If you seek to get rail training and significant experience by joining the Reserve, it’s not going to work, and as a member of the Transportation Corps you may just find yourself driving a truck in Iraq – perhaps not quite what you had in mind. Various coastal defense gun batteries existed in New England up through World War Two. These included some very large gun installations such as the 12 inch coastal guns at Battery Milliken in New Bedford. From places such as Rock Island Arsenal, Illinois and other govermnment munitions plants, or munitions storage sites (such as Hawthorn Naval Weapons Depot, Nevada), the New Haven Railroad would have been the only way to transport munitions (artillery shells, propellants, fuzes) to such coastal defense sites. Munitions would have travelled in appropriately placarded boxcars, which may or may not have had military escorts. As individual cars carrying Class A Explosives, handling of such would have required special notice to the train crews. Ammunition and other military shipments of a dangerous nature always required and still do require special handling. Cars have to be placed no closer than five cars from the engine or caboose. The cars often had escorts from the military and sometimes they had speed restrictions too. Of course these cars could not be humped. Both humps at Cedar Hill had a track behind the hump called the “Dynamite Track” which would often be used for cars of this nature if they moved in a regular freight train. Sometimes cars with certain items were moved in special trains and sometimes these trains would not necessarily move via the main lines. Picture above is protestors blocking a troop train. Over 40 million men and women served in W.W.II and almost every one of them rode a Troop Train during that war. In the latter part of the war on any given day over one million servicemen were riding a Troop Train. The US was averaging 2500 Troop Trains a month. We continued to use trains to transport soldiers during the Korean War. Large numbers of military units in the eastern half of the US rode trains to the West Coast to ship out to Japan, and then Korea. The last major troop train to be used was in 1965 when 15,000 men and their equipment from the 1st Infantry Division (the Big Red One) rode the rails from Ft. Riley, Kansas, to Oakland, California on their way to Vietnam. I never realized at the time I “rode” in it that it was the last major one. Makes sense though. By 1965, passenger was passé. It was probably tough to find all the equipment. What we had was a bunch of “rainbow” trains. During W.W.I and W.W.II railway bridges and tunnels were guarded to prevent sabotage from disrupting the critical flow of troops and supplies. When the 1st Infantry Division deployed to Vietnam many of the same bridges were guarded against American war protesters trying to stop the Army from sending solders to another foreign battle ground. Times had changed since the Pearl Harbor generation rode the rails to war. During Operation Desert Storm, Fort Riley could deploy an entire division in 28 days. Now an entire division can be deployed in about seven days. This is made possible with a recent $13.5 million expansion project of the rail yard at Camp Funston. Brig. Gen. Randal Dragon, deputy commanding general-support, 1st Infantry Division, and James Young, Union Pacific president, will drive in the golden spike, signifying the completion of the project and opening of the rail yard. Shown below is a picture of what Camp Funston used to look like. We had an inquiry from the New York Guard concerning this incident. (newspaper at top) The New York Guard is compiling its history and requested our help. Shown above is an overhead view of the New York Central Railroad bridge over East Creek. The location is on the New York Central Mohawk Division between Little Falls and Amsterdam. We found a “street view” of the bridge view” of the bridge from the parallel State Route 5. The railroad bridge looks to be a two truss bridge. It would have carried four sets of tracks in 1917 (only 2 now). So this is the spot where the two NY State Guardsmen were killed in the First World War. Elsewhere, the New York Guard had a First Provisional Regiment guarding the aqueduct to NYC, one man was struck by a train and lost his legs and died. That was down near NY City. The Second Provisional Regiment guarded the Erie Canal, bridges, Niagara power houses and munition plants all upstate. These were the State active duty part of a NY Guard reserve force statewide of 15,000 during WWI replacing the National Guard when it was activated. The New York Guard has the complete history of the First but nearly nothing on the Second and they are trying to piece things together from news articles, etc. Of course, that was just WWI. The NYG was again organized in WWII, and finally stayed in place starting in the 1950s. There was also have a train incident on a bridge 9 miles east of Elmira, and a sniper incident on that same bridge. The New York Guard is the State Defense Force of New York State. The New York State Guard is one of the largest and best organized State Guards in the United States and is historically derived from Revolutionary and Civil War era State military units that were reorganized several times in American history in response to various international and domestic crises. Organized under the Military Law, State of New York, the New York Guard cannot be federalized and cannot be deployed outside New York State without the consent of the governor. Members of the New York Guard are entitled to many of the benefits accorded members of other components of the ‘Organized Militia of the State of New York,’ the legal collective term describing the New York Army and Air National Guards, New York Naval Militia and New York Guard. These include ‘military leave’ for employees of state or local governments and many private employers. The symbol of the Merci Train is a frontal view of a steam engine with flowers on the pilot which are symbolic of Flanders Field, where many American “Doughboys” from WW1 are buried. The drawing was adopted as the official symbol of the French Merci Train Committee, and a plaque of the drawing was placed on each of the Merci box cars. The committee also had gift tags made bearing the symbol, and one accompanied each of the more than 52,000 gifts that came in the box cars. Parades and ceremonies of welcome were conducted in the state capitols and major cities of almost all the states. The largest and most attended was in New York City where more than 200,000 people turned out to welcome that state’s assigned box car. A description of all of the gifts that were in the box cars would fill many books, and the stories of the origins of those gifts would fill many more. The box cars themselves were antiques by 1949, having been built between the years of 1872 and 1885, which means that those still surviving today are more than 100 years old. Forty-and-eights were French 4-wheel boxcars used as military transport cars (the term itself refers to the cars’ carrying capacity, said to be 40 men or eight horses). 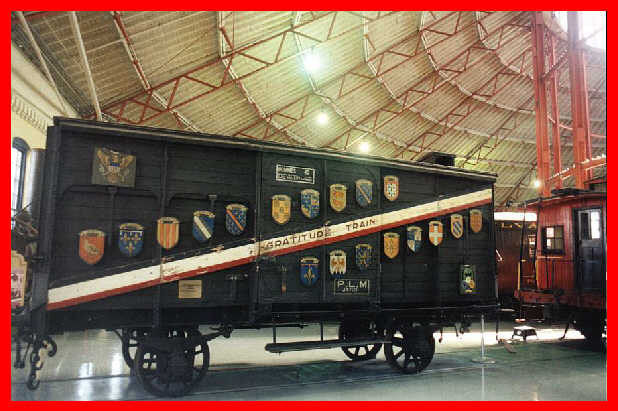 Built starting in the 1870s as regular freight boxcars, they were originally used in military service by the French army in both World Wars, and then later used by the German occupation in World War II and finally by the Allied liberators. During the war years the cars ferried troops, prisoners of war, horses, freight, and infamously the Jews and others the Nazis considered “undesirables” rounded up in France and sent to concentration camps and likely death in the Holocaust. Trains of “Forty-and-eights” were frequent targets of opportunity for Allied fighter-bombers operating over occupied France, since they likely held German troops or supplies; unfortunately sometimes a train of prisoners was indistinguishable from a troop train. In 1949, France sent 49 of those boxcars to the United States (one for each State then in existence and one for Washington DC and Hawaii to share) laden with various treasures, as a gift for the liberation of France. This train was called the Merci Train, and was sent in response to trains full (over 700 boxcars) of supplies known as the American Friendship Train sent by the American people to France in 1947. The cars were operated in WW2 in both the European and Domestic Theatres. The trains (at least in the USA) were equiped with at least one car equipped as an operating room to perform any emergency surgeries that might be needed during transport. There was another car that was more like a clinic or doctors office for changing dressings. The whole idea of a hospital train was to provide a fully equipped hospital on wheels to take to where it was needed and to park. These were more like med-evac flights of today where a large # of patients are transported out. The operation of these trains was more or less for supervised care of patients while in transport. The use of a Hospital Train today for disaster relief in many ways doesn’t hold up as they really aren’t a hospital on wheels, they are more like a really big/long super-capable ambulance. An Army CSH (pronounced “CASH” today’s decendent of a MASH unit) is much more capable and able to get to where people need them. A hospital train is dependendent on rails being intact where’as a CSH can be trucked or flown in avoiding destroyed RR tracks. A scenerio that could work well for a hospital-train might be to have some to evac hospitals or nursing home before a disaster avoiding the need to assemble a large convoy of ambulances. I would have to say the best way to get a hospital to a disaster is if near water, hospital ship (US has 2 USNS Mercy and USNS Comfort), anyplace else, Military “tent hospital” (parts are also containerized)like an Army CSH. The Army CSH can be flown in using planes that can use improvised landing strips, or they can be trucked in. An Army Cash also has field kitchen facilities capable of serving large numbers of people including staff and a full patiend load. They can also set up shop in buildings. Very briefly, railway surgery was the medical specialty devoted to caring for railway employees, and sometimes non-employee family members or injury victims. A railway surgeon was a physician who practiced railway surgery. Railway surgeons provided a wide range of care including trauma care and occupational health services. They worked out of their own offices or at hospitals and clinics the railroads established. Many employee timetables contained a listing of them. Rhoades Hospital was built during WW2 and was served by the Ontario & Western who ran numerous hospital trains into this facility near Utica, New York. I do know that Bert Daniels, who was road foreman of engines for the NYC, was the engineer on this train which ran from September 15, 1936 until November 21, 1936. From the news clippings it appears that this train was some kind of Convention Special tour train. The articles state that it was a 12 car train with air-conditioning which had a streamlined engine identical to the Commodore Vanderbilt engines that pulled the 20th Century Limited at that time. It also had an auxiliary booster engine on the trailer wheels that gave an additional 15,000 lbs. of tractive effort in starting. Was this engine a precursor to the Niagara type engines? The article states that the engine had 4 drivers to a side instead of the customary Pacific type. The only photos of the engine are mostly frontal and seem to show a 4 wheel leading truck. The train was nicknamed “Old Roxie” and from the schedule that is included in the book appears to have traveled from Boston to Albany, NY then through PA, Ohio, Ind, Ill, Iowa, Ky, W.Va, Va, NC, SC, Ga, Tenn, Miss, Ala, Fla, and ended up in Chicago then on to Seattle. The book states that this train covered 29,000 miles overall. At one point while on the NorthWestern it had covered 14,000 miles without being shopped. The only thing that had been done to it was inspections. It was also an oil burner because coal wasn’t available in the Southwestern area. Instead of a “Johnson Bar’ it had a wheel reverse gear and also had automatic train control. 1936 Rexll Train in Virginia. Bert Daniels, engineer on the Rexall train, had an unusual career with the New York Central. He became a freight engineer, then served in World War I with the 54th Transportation Corps in Europe. After the war he returned to Utica and in 1925 was advanced to passenger engine service. Two years later he became road foreman of engines, a position he held until 1940 when he was promoted to supervisor of fuel and locomotive performance. In 1942 he was promoted to trainmaster at Rochester, and was transferred to Utica in 1943. In 1953 he requested a return to road service. His seniority was intact and he had his pick of trains on the Mohawk Division. His choice was the Ohio State Limited. The engine was NYC 2873, a Mohawk 4-8-2 converted to burn oil for this use on the train and the streamline cowling was inspired by the Commodore Vanderbilt Hudson 5344. The locomotive lost its streamline cowling after use on the Rexall train and converted back to burning coal. I picked up a lot of information frpm New York Central online forums. The train was painted blue and white, with red lettering on the locomotive, white lettering and black roof on the cars. The cars were all fairly stock Pullman cars (mostly parlors) which received rounded roofs and full width diaphragms to create the appearance of a streamliner. Other than the streamlined roof and the diaphragms little was done to modernized the cars, though most interiors were stripped. Whitney, Rexall “Kantleek”, baggage-club – to Alton 419, to GM&O 419. Haldeman, Rexall “First Aid”, 16 section sleeper – to Pullman tourist sleeper 4278, to SPMW 5554. Kentleek (originally Pullman Plan 2415H) was configured as a generator – workshop – storage car, probably one of the earliest examples of head-end power being used. The generators were needed for powering the AC, lights and display motors. Not open to the public. First Aid, built to Pullman Plan 2412F, retained its 16 Sections for the Rexall crew and staff and was not open to the public. Ad-Vantage, Research, Bisma-Rex and Cara Nome, all were stripped of their interiors and set up for displays, with Ad-Vantage also featuring a soda fountain. All four cars were open to the public and featured the many products that Rexall made. Klenzo, built to Pullman Plan 2916, was stripped of its interior and set up as an 88-seats lecture car which doubled as a dance hall after hours. The Rexall band accompanied the train on its tour and provided music for the staff, as well. This car was not open to the public, only to pharmacist and druggists. Symphony, originally built to Pullman Plan 2412C it was rebuilt by Pullman into a Plan 4004 dining car, which served the crew and staff of the train, as well as feeding druggists lunch, but not open to the public. Adrienne, built to Pullman Plan 2916, was also stripped of its interior and set up as an 88-seats lecture car. This car was not open to the public, only to pharmacist and druggists. Mi-31, built to Pullman Plan 2916, was stripped and converted to a bar-lounge-dance hall car, where store owners and druggists were entertained. The car was not open to the public. Joan Manning, built to Pullman Plan 2416, retained its compartment configuration and was used by the train’s crew and staff. The car was not open to the public. Puretest, built to Pullman Plan 2502B, was a 4 Compartment private observation car, was said to be used by the Rexall president. I believe the shroud material removed from the locomotive at the end of its tour and stored at West Albany for a few years, probably going into one of the scrap drives during WWII. Bert Daniels was a close friend of my grandfather Ken Knapp. When he went from Trainmaster to the Ohio State Limited, he took a vacation in Europe. Mr. and Mrs. Daniels even brought me back a present! I got small cloth patches with the emblams of Nice, Cannes and Monaco. My grandmother sewed these on my sweater (and sewed them on other sweaters as I grew). Now the rest of the story! 50+ years later I live in Nice, France and my busness involves Monaco.